Financial theory tells us that portfolio construction is about finding a group of assets with low correlations to one another in an attempt to find the highest return for a given level of risk. This is one of the main benefits of diversification – finding investments that zig while others zag. This makes perfect sense in theory. The problem is when investors assume a false sense of precision when using the correlation statistic or any relationship for that matter. It would be much easier to forecast the future movements of the various asset classes and individual holdings within a portfolio if correlations were static, but they aren’t. Correlations are dynamic. The interplay between asset classes are always changing and evolving depending on the current economic or investment cycle. And no two cycles are ever the same (see here) which keeps things interesting. The fifty-fifty split smoothed out the performance, but the correlation data between stocks and bonds is the interesting takeaway here. 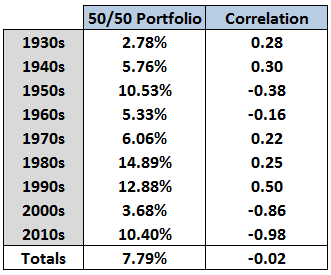 Over the entire 80+ years there was virtually no relationship between stock and bond returns (remember a correlation of zero means no relationship while -1 is perfectly negatively correlated and +1 is perfectly positively correlated). But breaking down the performance by different periods shows that the correlation is in a constant state of flux. At times they were positively correlated. Other times they were negatively correlated. 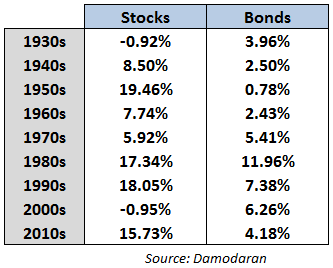 Sometimes negative correlation led to good returns while other times it led to poor returns. The same was true of the positively correlated decades. The problem with a focus exclusively on correlation is that stocks are up on average three out of every four years. So there isn’t an investment that perfectly offsets the risk and returns from stocks with similar performance. Correlations also tend to change when high returning strategies are discovered by the wider investing community. This doesn’t mean that statistics such as correlation aren’t useful when considering certain strategies to implement within a portfolio. It’s just that the data doesn’t really mean anything unless it’s put into the correct context. The best investors can do is put together a group of distinct factors in a portfolio with different expected risk and return profiles. Statistics cannot be smarter than the people who use them. And in some cases, they can make smart people do dumb things. As with most investment tools, statistical relationships can be helpful to pay attention to, but investors must understand that they can change over time.